Rather than being cold and clinical, our reception is decorated brightly to highlight our friendly approach. Many of the period features of the Victorian family house that we're based in, have been retained. One of our aims is to educate clients and provide information about a variety of pet care and health issues free of charge. This is why we have various information boards dotted around which are regularly updated by our nurses. Our reception staff are trained to answer many common questions. For more detailed advice, we offer free nurse clinics. We don't want to hard sell anything, so we limit the shop part of our reception to a few products that we believe in and use ourselves. As our main consulting room, this was built from scratch as part of our refurbishment in 2011. This climate-controlled room is light, airy, and has special flooring with an antimicrobial coating and an adjustable height consultation table. There is a specialist pharmacy fridge, meaning drugs and vaccines can be stored under very tight temperature control. Used for nurse clinics, our second consulting room is large and bright. It was built from scratch during the second phase of refurbishments in 2011. Like our main consulting room, this one is also climate controlled with special flooring, lighting, an adjustable height consulting table, and a pharmacy fridge. 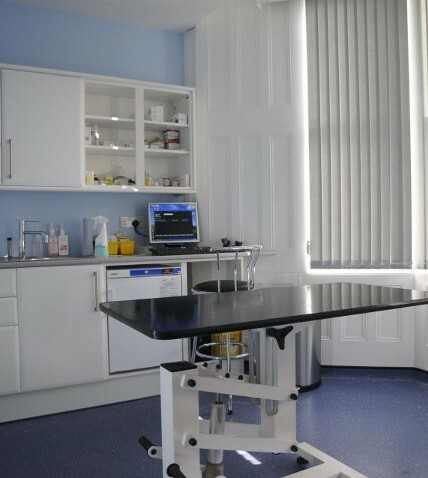 This room is largely used as a dark room for ultrasound scanning and for performing opthalmological examinations. However, our vets do use it to consult in when we are busy. Our laboratory has equipment to perform most ro utine blood biochemistry and electrolyte analysis quickly. This allows us to monitor hospitalised patients, assess essential parameters for critically ill patients, and perform pre-operation blood tests, which we particularly recommend for older pets. Proud to be a part of a national quality assurance scheme, our lab equipment is regularly tested for accuracy. We have a binocular microscope, usually used for diagnosis of parasite infestations, investigation of infectious diseases, or checking for crystals in urine samples. We're also able to run dipstick tests on urine samples and test specific gravity. For non-routine diagnostic tests, we use a variety of national companies, who'll send a courier to collect samples daily. B eyond the reception desk is our pharmacy area where we have a selection of prescription-only and non-prescription items. We also stock many types of specialist dietary products. In many cases, we are able to order non-stock items from our trusted suppliers for next-day delivery. Please note, however, our suppliers don't work on Saturdays and Sundays. 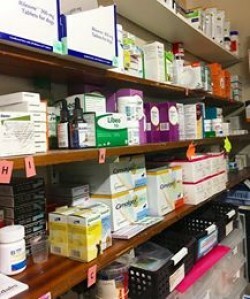 Once you go past our pharmacy, you'll find our preparation room. Linked to the main kennel room, animals are brought through to the preparation room for induction of anaesthetia, clipping and skin preparation before being transferred to the operating theatre next door. It is also used for dental work and other procedures where sterile conditions are not required, but anaesthesia is. 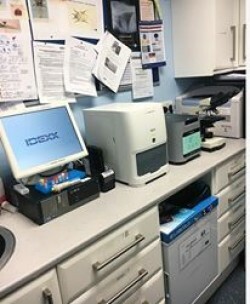 X-rays are also taken in here. 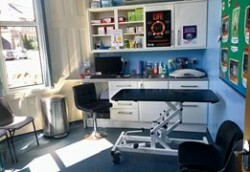 Fully refurbished in 2008, our operating theatre is full of facilities. 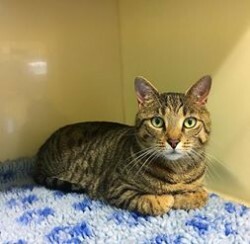 With a scrub sink, operating light, and anaesthetic machine being purchased to complete the room, your pets are in great hands. We also have an autoclave for sterilising instruments, and a sevoflurane anaesthetic vapourizer, meaning we offer the latest and gold standard anaesthetic gas. Although all anaesthetics come with risks, we are incredibly proud of our anaesthetic safety record and low post-surgical infection rates. Our purpose-built kennel room contains all the facilitie s needed to house and look after eight animals. Whether they are hospitalised, waiting for, or recovering from operations, this is where your pets will be. We also have an isolation unit, an intensive care unit, and can provide oxygen therapy. Inpatients are given personal care plans and are under almost continual supervision during the day and are regularly checked overnight.